David Kilgour of The Clean released his second solo album in 1994. Sugar Mouth, out again in a fine reissue edition from Flying Nun, and Captured Tracks in the USA, is an altogether more traditional affair than some of the guy's more recent albums. 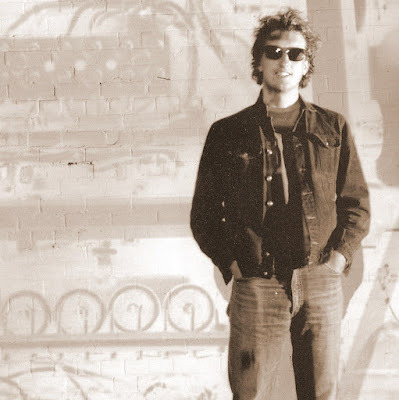 In 2014, I reviewed End Times Undone from David Kilgour and The Heavy Eights. On that one, Kilgour seemed to be channeling Neil Young. That's an easy task given the guy's considerable talents. On earlier releases, like on Sugar Mouth, Kilgour was more interested in making music that feels more familiar to anyone who's picked up and cherished a Flying Nun release in the first decade or so of that label's existence. Tracks here like "Fallaway" unfurl with The Clean's sense of pop intact. Kilgour is interested in textures on this second solo album, like on the near-shoegaze touches in "Filter" which sounds like one-time label-mates Straitjacket Fits, and he's also intent on keeping things concise. If recent albums feature guitar work-outs, Sugar Mouth keeps those moments brief and to the point. Sure, "Crazy" has a charging riff that recalls The Clean's "Getting Older", so much so that the song sounds just like The Clean, but the track never once overstays its welcome. Elsewhere, on stuff like "Never End" and "Look At It", Kilgour very nearly comes close to hitting on folk rock territory. Fans of early Chills releases will dig these tracks especially as the tunes are gentle and ruminative in ways that recall label-mate Martin Phillipps' band more than they do Kilgour's own. That's not to say that large swathes of Sugar Mouth don't sound just like Kilgour's Clean but, rather, that this album, more than many in his solo output, is largely in line with the sound of Flying Nun. This new edition of Sugar Mouth (1994) features 10 bonus tracks which include demos and a few outtakes like "Winter" with its ringing hook, and "Middle Of Nowhere" with its mid-period Kinks-style languid rhythms. Sugar Mouth (1994) benefits from this wealth of extra material as the demos illustrate Kilgour's songwriting process and the final tracks shine with the added layers of production and instrumentation. Quite simply, Sugar Mouth (1994) may indeed be David Kilgour's best solo album to date. I say that fully acknowledging how much it sounds like The Clean. Of course, if you want to hear Kilgour unleash fire on the axe, this one might not be your first choice to pull down from the shelf. However, if you want to hear the best indie-pop that Kilgour's ever procuded aside from his main group, Sugar Mouth (1994) should probably be the record you grab. Sugar Mouth (1994) by David Kilgour is out now via Flying Nun and Captured Tracks.